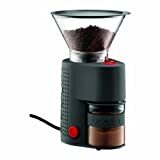 This little Bodum Bistro electric burr grinder looks great and more comfortable with 14 grind setup, consistent grind and some special feature like timer, large hopper ,exclusive anti-static glass catcher, 5 more designs ,quiet operation and easy cleaning. The average customer is satisfied with the outcome of this Bodum Bistro grinder, yet something should be fixed they think. Well, you will not see the entire perfect in any product and from this point the grinder is also less costly under $100. Considering all things, Bodum Bistro is a very good product for your home. Have you ever used borosilicate glass catcher for your coffee grinder to prevent jumping grounds and static issue? Coffee lover folks are always fond of this exclusive feature you find in bodum bistro electric burr coffee grinder. My bodum bistro burr grinder review will show you why you should have this one for your home. Like other burr grinders Bodum Bistro gives you 14 adjustable grind settings for any of your favourite brewing method. In addition, max 20 second grind timer and fast grind button add a special preference among coffee lovers for this low price grinder. It is equally important if you a bit critical about that conventional black colour as Bodum Bistro grinder offer us 5 different colour choice. Unlike many of the coffee grinders, Bodum Bistro burr is unique for its glass catcher made from borosilicate. So you get somewhat relieved of static problem and jumping ground beans or spilling coffee. Furthermore, the coffee catcher easily holds around 1.2 pots of ground coffee. Another noteworthy part is that this glass canister is slip-proof for it is made of silicon band. In case you break the glass, Bodum Bistro renders a replacement service to you. Even you can change the glass catcher with your matching colour. Contact bodum.com or you can buy from Amazon here or contact them on their website for receptacles. But be aware of using lid as they unfortunately do not offer any replacement lid with the catcher. You can also use small glass canning jar that adjust with this bodum bistro very fine. Another essential feature of Bodum Bistro is the pre set timer and push button. You can grind according your need by dialling the timer and pushing the button. This system also allows any wastage of coffee grounds and so keeps bean always fresh, cool and pure. The timer setting is not for how many cups you want to grind. It actually counts time around 5-20 seconds. As the amount of coffee per cup varies for different people, this timing system is better i think. It can confuse you at first but you can quickly adjust to it. If the 20 seconds grind is not enough to you, give it rest for some time say for 5 minutes, then again grind. This is the case if you desire to have a grind for a crowd. Fortunately we need not all time grind for lots of them. Don’t think about the storage of coffee in the ground container as the plastic lid sitting over the glass canister is not sealed and has a hole to pass the air through and made only on purpose of catching the grounds. If you need an airtight cover, using plastic wrap may be a solution but every coffee connoisseur ‘s suggestion is that always keep ground coffee in a good metallic storage can to make your coffee fresh avoiding damage. Bodum Bisro is suitable for any brewing method including espresso, French press, chemex or drip coffee and any others with its 14 great settings. To know you more Bodum gives you an Ideal grind for chemex, coarse grind for French press, medium grind for drip coffee, finer for espresso. In fact your experiment will do the rest. This video may be of your help showing you different coffee grinds in different adjustment and how to use them. Many users find it complex to remove bottom burr for cleaning. Truely it is fixed. However it’ll be no issue if you sometimes grind uncooked rice or use small brush to keep the burr clean. The sound of Bodum is a little loud but not unbearable. Most of these buyers don’t mind it because they always consider it for much affordable price and for having consistent grind. Cleaning is easy but many users find it complex to remove bottom burr for cleaning. Truly it is fixed. However it’ll be no issue if you sometimes grind uncooked rice or use small brush to keep the burr clean. Some users use porta-filter for saving time. It is ok if you are habituated with porta-filter for direct brewing but it’ll be the best way to unfold the jar into your filter with less mess. Above all, Bodum Bistro is an amusing grinder if you value the price and other weighty features. This video shows Bodum Coffee Grinder unboxing and arranging for use. If any case, you have a problem of rearranging bodum grinder, Check out this solution to the troubleshooting . There is absolutely no denying the fact that newly ground coffee is better tasting. the reason that it is it is quite capable of doing other activities. It really is one of the most crucial kitchen table tools humans have come to appreciate. Thank you Chance Rapanot. We always recommend to grind just before brew for it will offer you all time fresh coffee with sweet aroma and great flavor you ever wished. And best quality coffee grinder is the first priority. This budget friendly bodum bistro grinder can be your first quality grinder if you are newbie on coffee arena or want to have one for budget,definitely this one is your right grinder for almost all grind!